Yep, this is my Little Miss Stevie. Isn't she just gorgeous? Cute! I just got a parakeet and am trying to train him - any hints? so blue! Hello Miss Stevie! Oh Hello! she is lovely! Thanks guys... she's just the most lovely bird. Welcomes me home when I've been out and talks to the television and radio - even when I'm there. 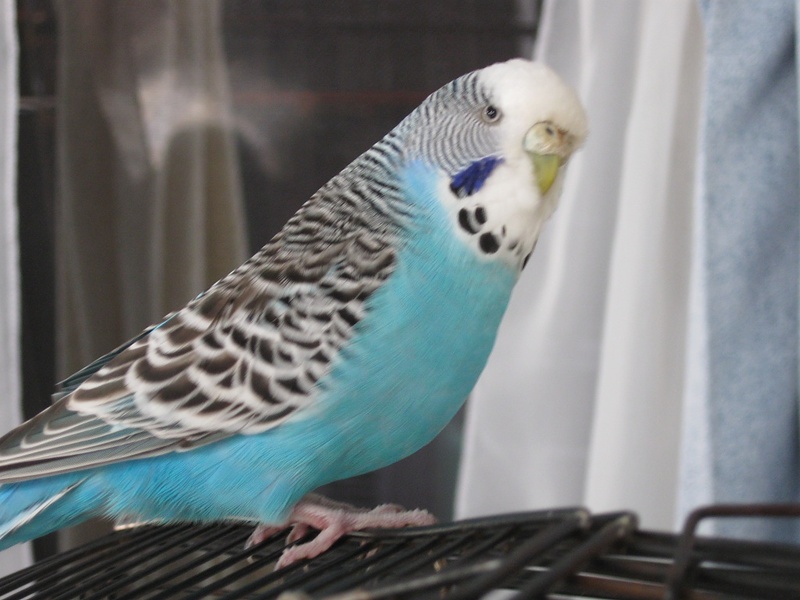 Quinn, if your parakeet is young, give him/her time to get used to you being around the house and their cage. About two weeks in, after they've gotten used to their surroundings, put your hand in the cage... they'll hate it, but you'll be doing it a lot; and they have to get used to it. Otherwise, there'll have to be a lot of patience from you. Teaching them to talk is something that will be another thing; try not to swear around them... they're absolute sponges if they're male and tape recorders too! As they get older, they will become cheekier and try to eat what you do... don't let them; it's not good for them and will make them sick. Otherwise, if you make it to 5 years with them, you've done well! Fantastic shot. She is very nice. how cute! such a pretty bird! Hi Little Miss Stevie! I'd love to have one at home like you, but I'm on pet-overload already! Darling picture! Thanks for all the good tips. I assume th paper goes down on top of the cage floor, so he doesn't get his toes stuck? Do you let Miss Stevie out to fly around or are her wings clipped? She sure is a pretty bird! Little Miss Stevie is beautiful! Hi, Little Miss Stevie, nice to meet you...you are looking very beautiful! Quinn: yes... the newspaper goes on top of the steel where he's standing in the photo you have of him from a few days ago. Now, clipping his wing is going to be a tough one. Get the vet to help you with the first time and keep only one clipped (don't let them do both; you'll never get him strong enough to fly). and make sure his claws are clipped too (there are proper clippers you can purchase for that from pet stores; and they don't cost too much either). Just be sure to snip just the end off otherwise you'll get the blood supply and he'll bleed; it's the same with the wing. Food is another thing. You can feed him grass seed, but make sure it's not the big thick 3-pronged grass seed... only the thin 3-pronged one before it flowers. The thick one is poisonous to budgies. Millet spray is something of a treat for budgies too... and make sure it's not bagged as it'll be sure to go mouldy. Cuttlefish is great too. Both of these can be found at pet shops too; but the cuttlefish might take some time for him to warm to.